Welcome to Crystal Cloud Graphics Web ring page! I try to join web rings with associated topics to this site. So if you wish to find more sites that have information on related subjects, this is a good place to start. Occasionally I join a ring that is not related directly to the subject matter on this site. The web ring then is a group of web pages of people I am proud to be associated with for a personal reason, so please explore those sites too. 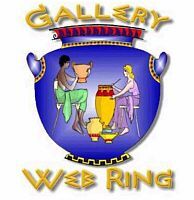 All the web rings are interesting, enjoy browsing them. If you came to this page from a ring, please take the time to explore the Crystal Cloud's many lovely graphics that specializes in free religious, spiritual and esoteric web theme graphics. Links to all my pages are at the bottom of this page. You'll always be able to return to this page to continue your web ring journey.